Flax was one of the first European plants cultivated in America. From the earliest settlements, each ethnic group brought its own types of tools to process flax. The Germans, French, English, Swedes, Scots, all had tools in the style of their homelands. Their linen made clothing, bedding, towels, upholstery material, grain bags, wagon covers, sails and many other items. Flax grows quickly, in less than three months. It is pulled out of the ground with the roots intact to preserve the full length of the fiber. Next, the seed was removed and saved for replanting. Surplus seed was pressed for its oil, which was used in paint and was burned in lamps for light. It was also the basis for printer's ink and had medicinal uses as well. 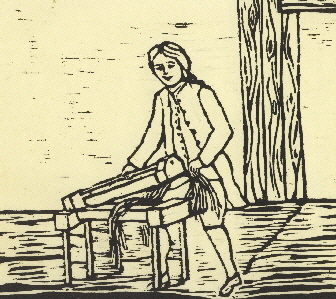 Flax was the primary crop in colonial America. 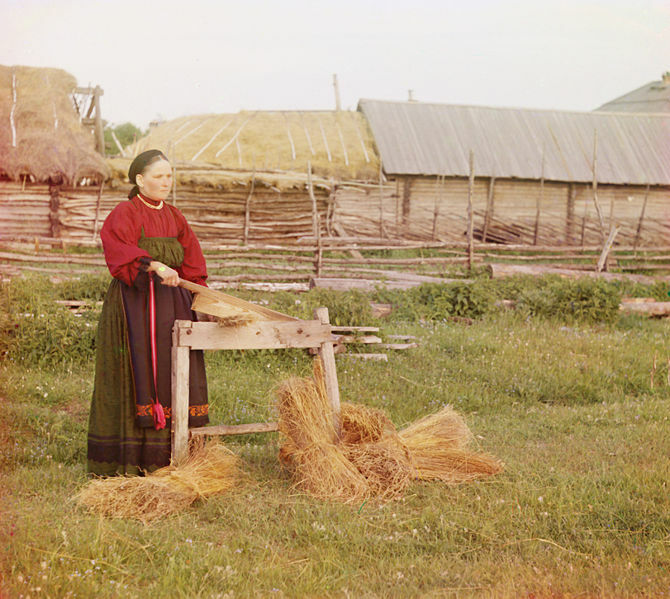 Processing the flax straw was a laborious process. 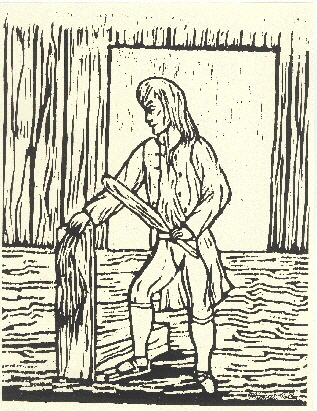 After retting, the flax was broken, scutched or scraped, then combed; each step required its own unique tool. 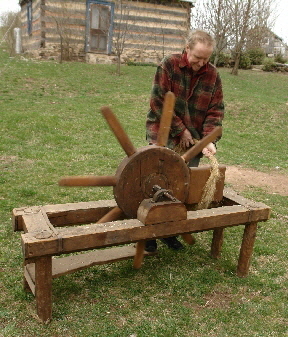 Breaking flax using a heavy, cantilevered German-style flax brake. Scutching or scraping the flax plant begins to remove the broken, crushed remnants of the stalk from the fiber. Shown is the two-edged scutching knife typical of Germany. British and Scandanavian settlers generally used a one-sided knife. Christian demonstrates the scutching wheel, a high-tech version of the single, hand-held scutching knife invented in Scotland in the mid-eighteenth century. 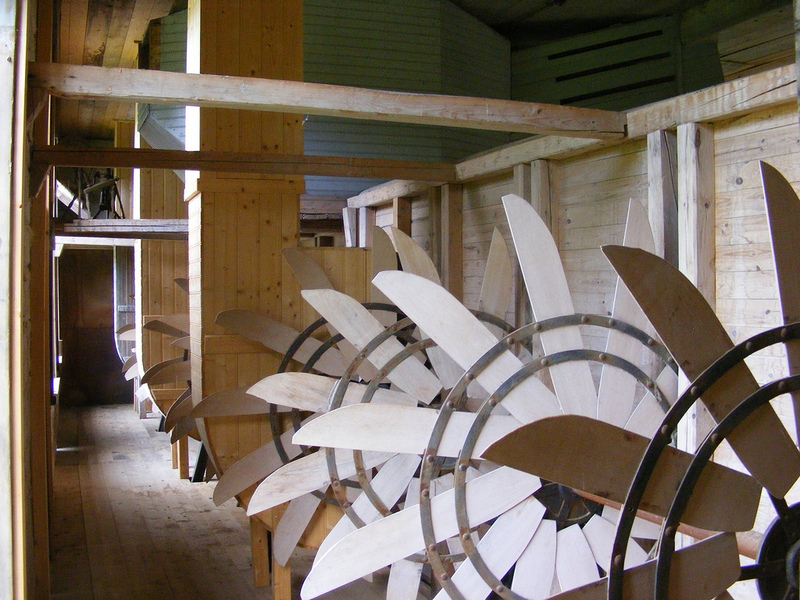 Its eight blades are put into a revolving wheel powered with a foot treadle. Such wheels were typically owned by professional flax dressers who, like modern combine operators in the Mid West, went farm to farm processing flax for a fee. 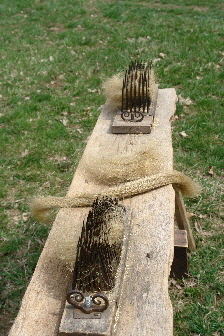 Coarse and fine combs on a single bench whose legs can be taken off for easy storage when not being used. Wooden box lids cover the combs when stored for safety. Right, combing separates the long, line fibers that make the best linen from the short, tangled tow fibers, which are also useful. Traditionally, tow from the coarse combing was used for stuffing mattresses, cleaning pots and rifle muzzles and for starting fires. Tow was made into rope, hence the term “tow path” along canals where the mules literally towed canal boats with rope made from tow. Tow was also used as the oakum tamped between the planks of sailing ships with pitch to make the hulls watertight. 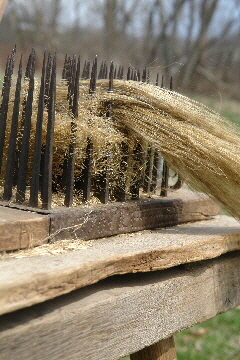 Tow left in the fine combs was a better grade and could be spun and woven into tow cloth, a coarser, stronger, heavier-weight fabric than regular linen. The long fibers are spun into a line of thread itself called linen. 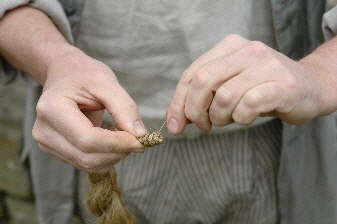 The long fibers are spun into a line of thread itself called linen. But first the fibers are stored in special twists called stricks, which are made in a process similar to braiding. 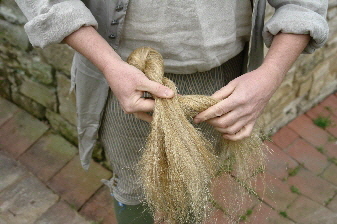 The end of the strick is not tied but rather the ends are wrapped into a lump held in place with spit. Weeding flax in Flanders, 1900. Late 19th century scutching mill in Finland.